This book is one of my favorite horse book although it sometimes concentrates more on love then on horses. 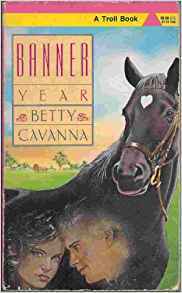 All Cindy thinks about is horses, especially the beautiful black pony called Banner and the 4-H program that teaches handicapped kids to ride. When Banner is seriously injured, Cindy becomes immersed in a nation-wide campaign to raise money for the medical bills. Eventually, she comes to terms with being a teenager, and her friendship with the gorgeous new boy in town, Tad Wainwright, blossoms into romance. The boy, Tad, is very jealous of the horse Banner because Cindy seems more concerned with Banner then her. They stop hanging out for a while but on a chance encounter she meets his dad again and they soon become friends again. That sounds interesting! I'm going to check it out!